Challenges of Teaching with Technology in HE: Towards a New Third Space? This chapter examines current debates and theoretical approaches to studying new media technology and learning in a Higher Education (HE) context. 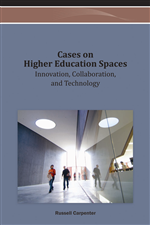 The authors interrogate the relationship between HE spaces, technological advantages, and engaging pedagogy to emphasize the importance of understanding complex interrelationships between technology and learning. The findings of the multi-method ethnographic research with 30 lecturers reveal how shifting globalized paradigms have led to paradoxical perceptions which further impact perceptions of professionalism. The chapter draws on Latour’s (1993) Actor Network Theory (ANT) approach to modernity, which, as a form of belonging, endorses democracy (Strathern, 1999). This ANT-inspired case study argues that we need to critically re-evaluate the hybridity of HE spaces and that the traditional distinctions between the social spheres of learning have become blurred, and that an ANT approach enables us to gain greater understanding of a new hybrid world. The ethnographic research presented in this chapter took place in a relatively new university (opened in 2007) with purposefully designed modern buildings and learning environments which have technology thoroughly integrated within them. The annual review of the university in 2011 described a modern IT-rich environment appropriate for its students in the 21st century. The experiences of students’ perceptions of technology in HE are well documented (Sharpe et al., 2010), but lecturers’ perceptions remain underexplored (Hanson, 2009). We draw on Massey’s (2005, p. 13) argument that ordinary space, “the space and places through which, in the negotiation of relations within multiplicities,” the social is constructed. In this case study, a multi-method ethnographic approach explores the reality of how academic staff across a new UK university perceived aspects of quality in relation to technology enhanced learning and teaching. Underpinned by Massey’s (2005, p. 1) suggestion that “the implicit assumptions we make about space are important and that, maybe, it could be productive to think about space differently,” we argue that spatial identities can be reconceptualised in relational terms. In order to adopt this relational approach, we undertook a research project which explored the concept of collaboration in relation to learning spaces but also which emphasized collaboration in relation to the research process itself. We sought to overcome previously dominant but unhelpful dualisms and adopted aspects of ANT to recognize the networks of heterogeneous materials that constitute the social (see Law, 1991).